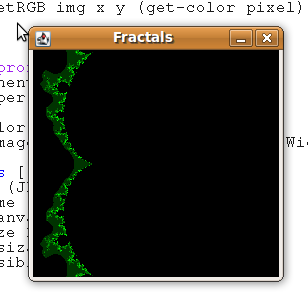 The Mandlebrot Set is probably the most famous set of fractals. The maths behind it is dead simple and with just a few lines of code you can get some impressive results. The harder part is translating a number between 0 and *max-iteration* into a decent range of colours. I'll ignore this for now and stick with green! Refactoring is the Java term for doing work.